With the beginning of another week we have the European Nintendo Download Update details, letting us know what treats are on the way soon. This batch includes major retail releases on both Wii U and 3DS, some DLC, intriguing download-only games and even a My Nintendo reward discount. Some WarioWare, a couple of retro RPGs, a batch of discounts and 3DS HOME Themes wrap it up, so let's get to the details. 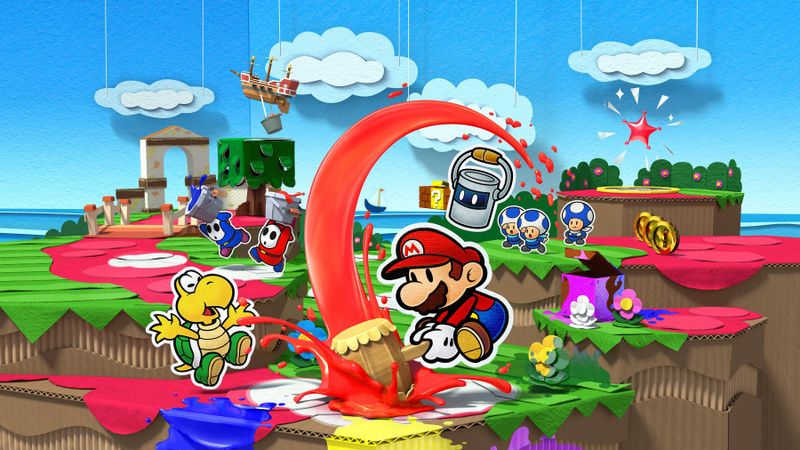 Paper Mario: Color Splash (Nintendo, €49.99 / £39.99) - The series finally makes its bow on the Wii U, as Nintendo puts its expertise of HD craft-like visuals to work once again. This one introduces paint as a core mechanic, and otherwise offers a blend of timed button presses and items in battles. We were left impressed after spending time with it for our preview, and will have a review with you before release. Available from 7th October. ACT IT OUT! A Game of Charades (Snap Finger Click, €9.99 / £8.99) - As the name suggests this is a party game in which you try to help others guess phrases or names. Originally on PS4, the GamePad touchscreen allows drawing to come into the mix in addition to acting and singing. 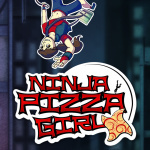 Ninja Pizza Girl (Disparity Games, €8.99 / £7.99) - A 2D runner with sources of inspiration such as Sonic The Hedgehog and Mirror's Edge. Rather than a health gauge, however, the theme judges your esteem as you dash through delivering pizza as stylishly as possible; mistakes and enemies bring on taunts from bullies, with this game seeking to raise awareness of these issues. PING 1.5+ (NAMI TENTOU MUSHI, €4.49 / £3.99) — With retro-styled visuals and a steep difficulty level, this is over 100 levels of trying to shoot a cube through over 100 increasingly tricky levels. Though we feel this one falls short in some aspects, it has plenty of promise and good ideas in its favour; our review explains why. PSIBO (NAMI TENTOU MUSHI, €4.49 / £3.99) - Another title from this developer that opts for a retro aesthetic, which need not be a bad thing. This includes an endless mode after a campaign of fighting through 'hexagonal defence systems'. VRog (ByteRockers' Games, €2.49 / £2.20 until 20th October, then €4.99 / £4.49) - A somewhat peculiar arrival as it's cited as a Virtual Reality game in which you play as a frog on a lake. That probably means exploring in first-person, though whether it'll have the same appeal without a pricey headset is unclear. 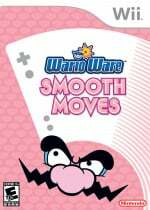 WarioWare Smooth Moves (Nintendo, €19.99 / £17.99) - The Wii's entry in the chaotic and rather fun series, the Wii Remote becomes the 'Form Baton' for quickfire minigames. Multiplayer is unlocked after clearing single player (oddly) but nevertheless this offers good silly fun; we liked it in our WarioWare Smooth Moves review back in 2007. Mario Party: Star Rush (Nintendo, €39.99 / £34.99) - The second entry of this series to arrive on 3DS, though this one aims to address some criticisms of recent editions. Players now all move separately and at the same time to speed up games, while the free 'Guest' download allows groups to enjoy the full multiplayer game even with only one player owning a full copy. We had a good time in our preview, and will have a review with you before the game launches. Available from 7th October. Mario Party: Star Rush - Party Guest (Nintendo, free) - As long as one of the players has a full copy of the main game, this allows a group of up to four to enjoy full local multiplayer for free. Epic Word Search Holiday Special (Lightwood Games, €7.99 / £5.99) - A continuation from previous entries in the series, but this time around it features categories themed around Holidays such as Halloween, Christmas and Valentine's Day. PixelMaker (Nostatic Software, €3.49 / £2.99) - Having previously brought us VoxelMaker, Nostatic now takes a similar approach to producing pixel art. At a budget price this promises the ability to utilise the portable for producing scenes of pixel art, which can then naturally be shared to Miiverse. We enjoyed the Wii U version in our review. Breath of Fire (Capcom, €7.99 / £7.19, or €3.99 / £3.59 until 20th October if you own Breath of Fire II on New 3DS) — The Super NES wasn't short of RPG titles, and here's one of Capcom's more prominent efforts from the era; you play as Ryu (and companions) who has the ability to transform into a powerful beast, which must be handy when saving the world. Our reviewer did feel that this is rather dated compared to its 16-bit contemporaries, a point we explained in our previous Breath of Fire review. Breath of Fire II (Capcom, €7.99 / £7.19, or €3.99 / £3.59 until 20th October if you own Breath of Fire on New 3DS) — Nintendo's classic 16-bit console is revered for many things, but one of its strengths was surely the abundance of RPG adventures that it brought gamers keen for an adventure. This may be a sequel on the Super NES, but it offers up just that kind of experience while being undoubtedly old-school — and harsh — in its approach. We nevertheless gave it a recommendation in our Breath of Fire II review. 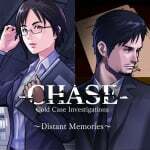 Chase: Cold Case Investigations - Distant Memories (Aksys Games, €4.79 / £ 4.80 when discount is redeemed for 20 Gold Points, normally €5.99 / £6.00) - Here's an interesting one, advance warning of a My Nintendo discount on a game due to be released on 13th October. Essentially a launch discount on the game, this will be available to redeem from 6th October until 27th October. Nothing for me...still waiting on F-Zero X & Super Smash Bros.
Color Splash and Star Rush physically, plus the Chase discount. Can't wait for that game, Hotel Dusk is one of my favourite games of all time. 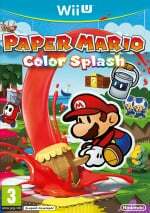 I'm buying Paper Mario: ColoUr Splash physically though I keep asking myself why. Hurry up review embargo. The Wii U eShop discounts are crap. The barefaced cheek of Nintendo asking for €20 for WarioWare: Smooth Moves. It can easily be bought for way less than €5 on Ebay. Physical copy of Color Splash for me, and I'm still playing DQ7 and Phoenix Wright for now. That VRog game interests me, but I'll wait for a review. I really, really hate when I buy a game on its launch and 2 months later developers give a half-price permanent discount on it. I feel cheated. However, I hope more people are tempted to buy Power Disc Slam at its new price. What's the need for the additional download in the new Mario Party? The first one just used Download Play... What was wrong with that? Gonna get Color Splash and Chase discount. Finally some use for the My Nintendo coins. That said, I wish Nintendo would do the same thing with their other games as with Fire Emblem Fates and allow the coins to be used for release discounts. Color Splash physically and those Mario amiibos. Breath of Fire 1-2 on VC first JRPGs since Earthbound on 3DS right? Hopefully Super Mario RPG and Square Enix SNES era JRPGs are next and America gets them too! Warioware smooth moves for 17.99 digitally or warioware from eBay for 2.29 pounds. @UK-Nintendo It's ridiculous, right? €20 versus €3. Hhmmm, let me think about that, it's a tough decision. And you can always sell it on afterwards if you like. They are releasing Color Splash and Star Rush in the same week for a reason. Big announcement within two weeks! Well, i'm waiting for Color Splash by physically. Of course, USA version. Mario Party actually looked really fun but i'm not sure i'll buy it day one. @gabikun Thanks for buying it! In an ideal world the price wouldn't have dropped so soon. Hopefully the price drop and incoming update will help create some sales. Senzonbakura is playable on 3DS and yet the home theme is based on the Playstation games. @Moon Island Tour didn't save the guests' progress after download play. With Party Guest, the guests will have their progress saved. Still want a review for Color Splash or Star Rush before I consider either of them. @RadioShadow I requested it. All discounts are specified by the relevant publisher. I really like that MyNintendo discount, that's exactly the sort of thing that they should be doing with every major release - the competition has 20% off new releases, after all! I wouldn't say Star Rush addresses the issues of recent Mario Party games: each player moved individually in Island Tour and the DS one too. Why does Nintendo release its big retail titles on fridays when the eShop update hits on thursdays, I'll never know. Is it for the sake of updating the eShop twice in a row? They should either release the games on thursdays or update the eShop on fridays. This only favors people who prefer physical over digital exclusively because of day-one-breaches. Will Star Rush still have Download Play though? I daresay that it will be a deal breaker if it doesn't. Paper Mario: Color Splash and Breath of Fire 1/2, but the only game I'll buy this week is Color Splash. I already own Smooth Moves. I didn't expect Star Rush to launch this early in Europe though; I hope it's better than Island Tour. What an awful game. @AlexSora89 so? Sometimes I can buy Friday releases on Tuesdays in the store. Just go physical man. @Mega_Yarn_Poochy @Moon Also allows those without the game to play as if they had the full game. Man you really are getting some SNES love on the 3DS, meanwhile here in America we get scraps. Sometimes I don't know NA game. 1. We seem overdue for a Kemco RPG on the 3ds. For a while in first half of year it was a game every two to three months. Since June. Nothing. Were sales that bad? I loved Chronus Arc and Justice Chronicles. 2. I have both Breath of Fire 1 and 2 on the gba. I assume SNES ones are identical. I would love Capcom to port 3 and 4 to the 3ds, although they seem to be Sony exclusives. Paper Mario (retail) and Chase cold case for me this week plus maybe Wario n Pizza Girl. This game looks very underwhelming! That Turbografx selection is gathering more dust. Will Murder on the Titanic ever leave the bargain bin? I won't be buying Paper Mario until they can be bothered to spell Colour correctly. Nothing for me right now, but I'll probably pick up both Star Rush and Color Splash in the near future (probably some time around Christmas). That My Nintendo discount for Chase: Cold Case Investigations - Distant Memories is tempting, but I'd have to confirm if I can buy the game this month before getting the discount. Not a bad week overall though, with two big releases, a nice bunch of Nindie games and a nice set of discounts. Shame this'll probably be one of the last good weeks in the year (the only weeks that'll gain any attention will be those with Rhythm Heaven Megamix, Picross 3D Round 2 and Super Mario Maker for 3DS). @sillygostly You're in luck! There is a limited number of games that can be played on other consoles via download play with only one copy. However, there will be a free to download acompanying app "Party Guest" that will allow the "full mulitplayer experience" just like you would have in Local Play. It even allows access to part of the single player campaign. You'll still need at least one copy for that though. I have a question......WHY ARE THEY GETTING MARIO PARTY STAR RUSH EARLY?!?!?!?!? @papershrimp That makes no sense. NEVAH I mean, I don't mind getting physical games, but I'm growing more and more accustomed to switching games within a console's own home menu (which all consoles have nowadays, compared to the early days of plug-and-play cartridge/disc switching) as time goes by. 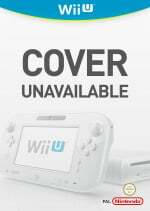 The only downside is Nintendo's "no, you don't own the game, you silly female canine" approach to it (namely, Nintendo ID being tied to the console; if anything happens to the console, we users can only kiss our accounts and games goodbye, which is not the case on any of the rival consoles), but other than that, it's been a blast so far. And yeah, I utterly loathe to have to switch discs on my WiiU by now, let alone Wii ones which require to open another submenu (which is why I get digital versions of the Wii games I own as soon as they come out on the eShop, as clustered menus are too dumb to deal with). Because localization. Look up Super Smash Bros. Brawl's European release date, you'll feel better. Same with Kirby Superstar Ultra. And Super Mario RPG, as well as EarthBound, as far as official releases go, of course. You and @SLIGEACH_EIRE should get along. @AlexSora89 other than getting games early I like selling them again after I'm done. Sure it's a little bit more inconvenient to get the disc or cartridge but if I can get back like 50 - 80 % of the purchase price (for good Nintendo games) then that's totally worth it for me. @Miiamoto 60+ English speaking countries in the world and they go with the one country(America) that took it upon themselves to wrongly change the spelling of words in the English language. It is the "English" language, it's not called the American language. Not only is the spelling wrong but the game's subtitle on the boxart looks stupid and non symmetrical as a result. I'd love for someone to create an alternative and people would easily see which is more pleasing on the eye. For what it's worth, this is the last week before PSVR launches. So it makes sense to get 2 big retail titles out there. And a vastly improved Mario Party and a brand new Paper Mario sound good to me. I'm getting the feeling that Nintendo is almost ready to reveal NX. It will be before the end of the month. But it won't be until after the 12th. If it doesn't happen before the 31st, it won't launch until May. Retailers and gamers selling their used games lived together in harmony... but then, the GameStop nation decided to attack! @AlexSora89 I think the same thing happened with Mario and luigi paper jam now that I think about it. It happens all the time, so I don't doubt what you said. Chase definitely, but without the discount as it's too small to bother with; I'll save my coins for the time being. Also, I will get Colour Splash, but not yet. I have too many games already and I think it's likely to decrease in value because the Wii U is almost dead. I'll get it on sale or second hand. Wait, are you actually worried for spoilers in a Mario Party game of all things? @AlexSora89 well yes and no. yes because I like going into new games COMPLETLEY unaware on the game(s). no because its Mario party and probably not a lot of things will be spoiled, but I still like going into games blind, and I'm STILL mad about that one guy on YouTube who decided to put the TRUE final boss in Mario and Luigi Paper Jam as a thumbnail. I'm what you would call a spoiler hound. I knew the plot twist in Mario & Luigi: Dream Team Bros. (without the bros. for you Yanks out there) from the beginning (courtesy of me taking my sweet time to finish it) and my experience was just as pleasant as it would be for anyone playing the game for the first time, unaware of everything.